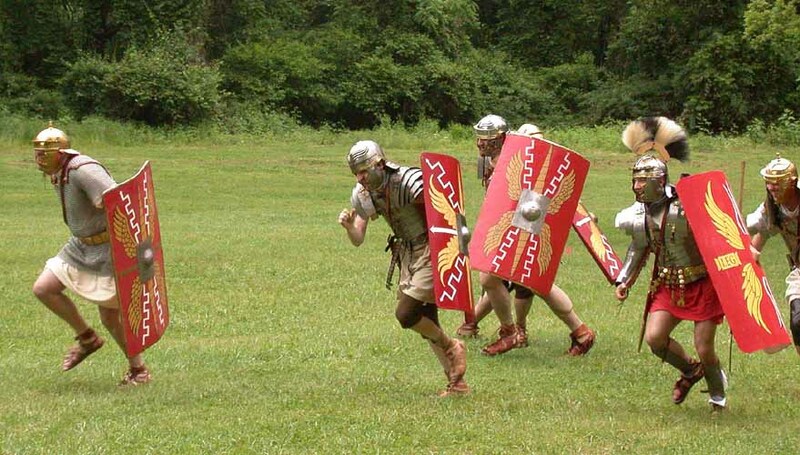 How long does it take for the Roman Soldiers, with their full suits, shields, helmets, and weapons, to run across a field? The field would be 180 meters. How about them in testudo? Lindford Christie took 9.96 seconds to run 100 meters. Now, this was a running competition, so he obviously wasn't wearing armor, helmet, and lots of clothing. He also was not carrying any large shields and weapons. Finally, he eats in today's diet and is 6+ft tall (thus longer strides). It was quite clear that the Romans would have taken way more than 40 seconds. The estimation of some people now would be 1 and a half minute. However, I want something more specific than that. Do you guys have any sources or calculations that shows the running speed of Romans in their gears? Have you tried looking up old olymic records? The greek used to run in helmet, armour+shield at that event and they had a tradition of documenting the winner's records. I would theorize that the Romans would have traversed the field in a manner that left some energy to fight, and a reasonably uniform group when reaching their destination. I was looking at modern rucksack jogging speeds. It is not a perfect match since they go longer distances (3 to 4 miles, with elevation gains on uneven terrain as well. Pack weight tends to be around 30 lbs or 14 kg.) I would say these people are covering 180 meters in around 1.4 minutes at endurance type conditions. If they only had to "sprint in heavy gear" for 180 meters on even ground, they should be able to do it in around one minute no problem. Now if fleeing, I can say a group of young boyscouts(with 30 lb packs) that think the noise behind them in the woods is a bear, can actually go faster than this! What about the fastest speed of the testudo formation? We're mostly desk jockeys, with little military or athletic training. I'm guessing our course was a good hundred yards overall, with a turning post at halfway. (To make it interesting, I deliberately did NOT specify which direction to go around the post! Ha!) I don't think anyone has ever timed it, but pretty sure it was less than 30 seconds. So, a man trained to run in his kit, going a longer distance but straight, shouldn't have any trouble doing that 180 meters in well under a minute! Forty seconds, maybe, or less. If you're talking about a number of troops trying to stay in some sort of formation, that means slowing down. You don't run in a testudo formation! It's called a "tortoise" for a reason, eh? We tend to move at a half step, i.e., move left foot forward, bring right foot up, etc. You can move at a slow regular march, especially with practice, but I would still expect no running. Not a lot of scientific data, here, but I hope it helps some!